How has Sweat-Less helped others? How do I use Sweat-Less? Hyperhidrosis is the clinical term to describe excessive sweating and it is a problem that many individuals around the world suffer from. People with hyperhidrosis often live in constant anxiety about their excessive perspiration and in severe cases it can cause difficulty in the work place, in personal relationships and it often results in negative feelings and lack of confidence. While we are all familiar with that clammy sweaty feeling on a hot summer’s day, hyperhidrosis causes the individual to sweat excessively and often at inappropriate times. The most common areas affected by this condition include under the arms, on the soles of feet, the palms of hands, the upper lips and between the legs in the groin area. In some cases hyperhidrosis occurs in a localized area and an individual may suffer from excessive head sweating or hand sweating, while other experience more generalized sweating in all areas. The good news is that excessive perspiration no longer has to be begrudgingly endured as there are now a number of treatment options available. In some cases, hyperhidrosis is a symptom rather than a condition and is caused by an underlying condition such as an infection, chronic illness, anxiety disorders or a disorder that affects the hormones in the body, such as Hyperthyroidism. In other cases, hyperhidrosis a medical condition on its own and it has little known cause. While normal sweating is strictly controlled by the hypothalamus and hormones, it seems that in people with hyperhidrosis something goes wrong between the message the hypothalamus sends to the sweat nerves and the amount of sweat produced in the sweat glands. Diet can hold the key to sweat control. Avoid complex carbohydrates (opt for high fibre cereals instead). Milk should be fat-free and salt intake should be limited. The recommended limit is 4 grams per day. Try to get the right amount of calcium into your diet and speak to a dietician about an eating-plan to suit your lifestyle. Avoid any pungent foods, such as onions and garlic (these foods will just add to the strong odor of your perspiration!). Drink plenty of fluids (8 glasses per day) as you will need to replenish fluid levels in your body. Never reason that if you drink less you sweat less – this is not so! Natural remedies can also help to support the nervous system and sweat production in the body. In fact, natural remedies have been used in traditional medicine for thousands of years to support the healthy functioning of the nervous system and the glands of the skin. 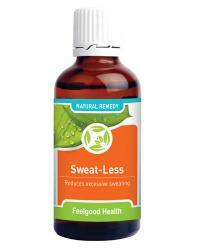 Sweat-Less is a 100% natural homeopathic remedy formulated to reduce excessive sweating. Sweat-Less can be used to safely support the nervous system and brain, without harmful side effects. This remedy contains a selection of homeopathic remedies known for their ability to address excessive fluid production on the surface of the skin. Due to the concentrated tincture formula, Sweat-Less is absorbed into the system with ease – exactly when you need it! Nat mur D6 – used extensively homeopathically as a tonic for the skin and skin glands, this remedy can also be used to address fluid secretions from the body – such as sweating. Lupulus 30C - used to address perspiration that is profuse, clammy or greasy. Castoreum 30C – useful when sweat seems to feel icy cold, and may smell sour. Argentum nit 6C - used homeopathically to address sweats brought about by fretting and made worse with fussing. This also suits those individuals that tend to get caught up in nervous excitement. Sweat-Less contains no gluten, artificial flavours, colours or preservatives. It is suitable for vegetarians and safe for all ages. Sweat-Less is presented in a concentrated 50ml tincture formula, making it easy to take. Hold bottle upside down and administer 10 drops directly into the mouth. Alternatively dilute 10 drops in quarter cup water and sip slowly. Children under 12 use 5 drops. Dosage may be repeated 3 - 5 times daily if needed until symptoms subside. May be used with DeodoRite tablets if needed. Sweat-Less supports the body on a cellular level – helping to support the nervous system - from the first dose. Sweat-Less contains homeopathic ingredients in a tincture formula that facilitates rapid absorption into the system – just when you need it! One bottle of Sweat-Less will last approximately 30 days (depending on frequency of use). Remedy to address excessive sweating plus anti-stress and anxiety remedy! Remedy to stop sweating plus internal remedy to fight bad body odour!